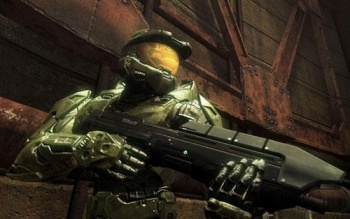 Frank O'Connor says Microsoft is more than willing to make a Halo movie, and might consider funding it itself. O'Connor, Microsoft's Franchise Development Director for the Halo series, was at the Future of Television East conference last week, was approached by a network exec about making a Halo movie. His response? The exec's reply? "For Halo, we will." Years after Peter Jackson was announced as the Executive Producer, the script by Alex Garland is still the primary candidate for the Halo film. Rumors have flown about who will portray Master Chief, everyone from Denzel Washington to Hugh Jackman, but no one has been officially cast in the role, and the movie hasn't even stably entered pre-production, being placed on perpetual hold. O'Connor claims that this is all the lawyers' fault. "It was the lawyers," he said. "When they went behind closed doors with the contracts, things fell apart. The problem was that the movie company couldn't make any money beyond the movie." He said that even if a movie fails in theaters, the studio who makes it will still probably profit, through licensing deals and DVD sales. However, because Microsoft owns all the licensing rights to the Halo franchise, the studio would be unable to proceed with milking the Halo name for all it's worth. That all seems like a big pile of setbacks, but O'Connor is optimistic. "There will be a Halo movie," he said. "We don't need a movie. But we'd like a movie. We'd like the moms of gamers to see the movies because they would love our characters. Maybe we'll even fund it ourselves."